At a Jefferson dinner, unlike minds ponder the future of Tallahassee and find ways to come together. At a Jefferson dinner, unlike minds ponder the future of Tallahassee. 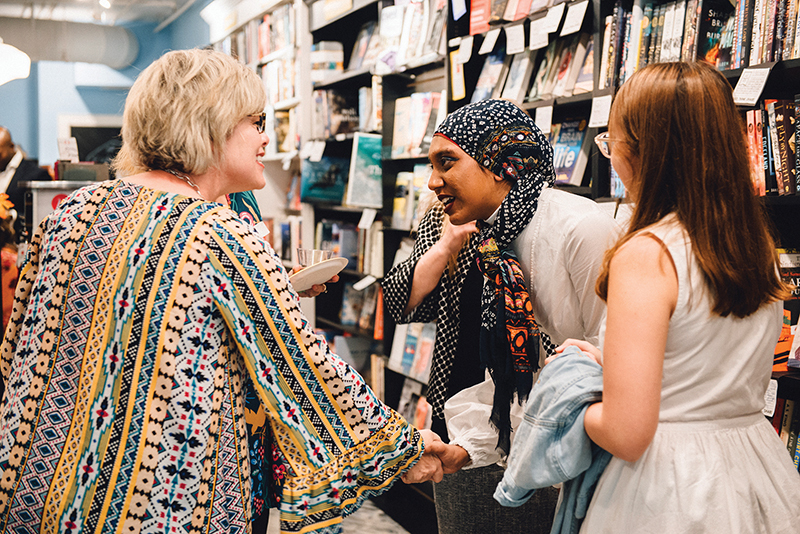 I’d like to get a sense of what each of you think the one thing is that we need to do in our community to help it thrive,” began Sally Bradshaw, the owner of Midtown Reader. She had gathered a group of 12 people, whose paths might not cross otherwise, over a meal on a Sunday evening in October. The setting was unusual: a long table set up among the stacks of literary fiction and nonfiction. Tonight the gathered group would share a meal — and ideas. The Village Square, a nonpartisan organization dedicated to promoting civic dialogue, had launched a new project devoted to replicating the unique dinners held by Thomas Jefferson, one of which was credited with saving the young republic. This means most dinners, which are comprised of friends, or in which dinners break off into several smaller side conversations, wouldn’t qualify, she added. Bradshaw launched the evening’s discussion by saying that she thinks that “silos” are a problem in Tallahassee. “I used to be in the state government and politics silo,” she said. The problem in Tallahassee, she said, is that people in these different silos don’t talk to one another enough, limiting their potential to solve problems together. When in Washington, the vice president lived in a boarding house on New Jersey Avenue about 20 paces from the new Capitol building along with some 30 other congressmen, all Democrats. It was from this boarding house he stepped to walk to work on the morning of his inauguration as president in 1801, and to its table he afterward returned to lunch. Inspired by Enlightenment ideals and recalling the fervent exchange of ideas he’d witnessed in Parisian salons in an earlier role as minister to France, Jefferson tried to recreate the salon environment in the White House during his time as president. “Jefferson would have 10 or 12 people over at a roundtable with no political agenda and they would generate a conversation,” said Clay S. Jenkinson, scholar and creator of the Thomas Jefferson Hour podcast, in which he portrays the third president, answering listener questions in Jefferson’s persona. “He was an exquisite moderator of conversation — he wouldn’t put forward his own views, but he would try to draw out everybody else,” Jenkinson explained. But Jeffersonian table talk had political implications too, he added. “Jefferson believed that we can only be a republic if we had a high level of social harmony and a sustained national conversation across party lines. One such dinner played a critical role to the early survival of the United States. In 1790, Congress was deadlocked over matters we take as a matter of course today: the national treasury and the location of government. At his table in New York City, then the capital, Jefferson served capon (a kind of rooster) stuffed with Virginia ham and chestnut puree, artichoke bottoms and truffles with a bit of cream, white wine and chicken stock added, with a calvados sauce made with the great apple brandy of Normandy. In the resulting “dinner table bargain,” Jefferson, secretary of the treasury Alexander Hamilton, and U.S. representative James Madison (who would later be president himself) agreed that the federal government would assume the states’ debts — Hamilton’s wish — in exchange for locating the federal capital in the agrarian states of Maryland and Virginia, as Madison and Jefferson wanted. The agreement is credited with helping to centralize power in the federal government. The stakes were not as high in Tallahassee, but in the tradition of Jefferson, Sally Bradshaw served lasagna, salad, and brownies and key lime squares for dessert to a group committed to improving the dialogue on major issues in their city. Inam Sakinah, chair of Power of WE, said that the campaign can serve an important function by convening conversations. “People say, ‘What’s the point of just talking?’” said Isa Colli, Power of WE’s vice chair. But Sakinah, Colli and other students involved in Power of WE believe that meaningful conversations across differences can lead to working together — an end in itself in an era of intense polarization. “We hope that through convening, crosspollination of different ideas and perspectives will take place,” Sakinah said. 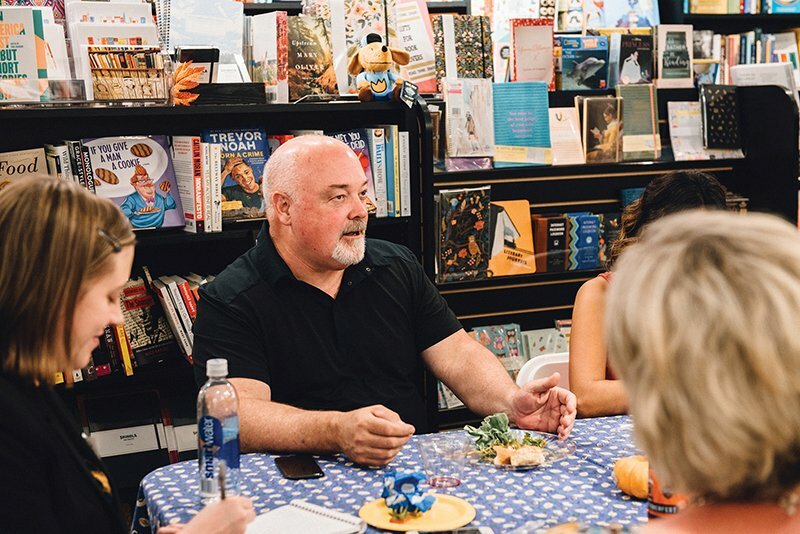 Tallahassee Democrat publisher Skip Foster connected the divisiveness of social media discourse to idolatry, relating a story a friend shared in church. In the story, a friend made an angry Facebook rant about a woman they thought parked illegally in a handicapped spot. It turned out, there was another side to the story — the woman had dropped off her husband, who had ALS, at the gate before parking — but instead of supposing they might not know all of the circumstances, the friend sought affirmation of their rage online. “In person you have the opportunity to ask why someone disagrees,” Sakinah suggested. She concluded that once social fabric is rebuilt, there may be hope for politics. Domi Station is a startup incubator and coworking space in Tallahassee. Its director of programs, Dominick Ard’is, peppered many of his dinner comments with examples from his own history. For instance, Ard’is told the group about a program he created in grad school at FSU as Speaker of the Congress of Graduate Students where he rented charter busses and organized tours of Tallahassee. The goal of Tallahassee Tour and Luau, he said, was to help new students familiarize themselves with the city. Businesses and policymakers have long struggled to reverse Tallahassee’s brain drain by developing reasons for graduates to stay. Now Ard’is asked: Could exposure be a solution, not just to the problem of brain drain, but to other issues in Tallahassee as well? Another key issue for him was family security. Ard’is sold bubble gum as a kid, he said, because it has a “better margin” than other candy and it sells faster. In high school, he faced a crossroads. As he considered stopping selling candy and moving into selling drugs, another guy whom he looked up to and didn’t know was selling drugs turned him around. The group discussed how people can take small steps to begin to address a problem, and how projects might be scaled, bringing up “Make a Difference Tallahassee,” a community service day that was part of a national campaign by USA Weekend. It fizzled in Tallahassee several years ago, though other communities continue to hold events. Dina Foster said she wants to see policymakers do the work of connecting issues, and in particular raised the link between crime and development in Tallahassee. “If we are fixing blighted neighborhoods, why aren’t we working in those neighborhoods with the highest crime rates?” asked the Tallahassee attorney and former North Carolina district court judge. “Whatever it is, find like minds. Just focus on getting it done,” Ard’is suggested. In Jefferson’s time, Tallahassee was the far west, part of an unknown geography about which he was tirelessly optimistic. Of course, schools, counties and streets throughout the country are named after Jefferson, but in Tallahassee, one can find several unique physical markers that connect us to him — evidence of the man in a place he never visited. A statue of Jefferson’s grandson, Francis Eppes, was erected in 2002 outside the Westcott Building at Florida State University because Eppes helped found the State Seminary West of the Suwannee River, the school that would become FSU. More recently, students petitioned to tear down the statue, citing Eppes as a slaveowner and enforcer of slavery, which he was — as Jefferson was. Finally, Vancore said that the rotunda at FSU College of Law was patterned after the one Jefferson designed for the University of Virginia, inspired by the Parthenon. “I see us in Tallahassee tearing down a lot of our history. 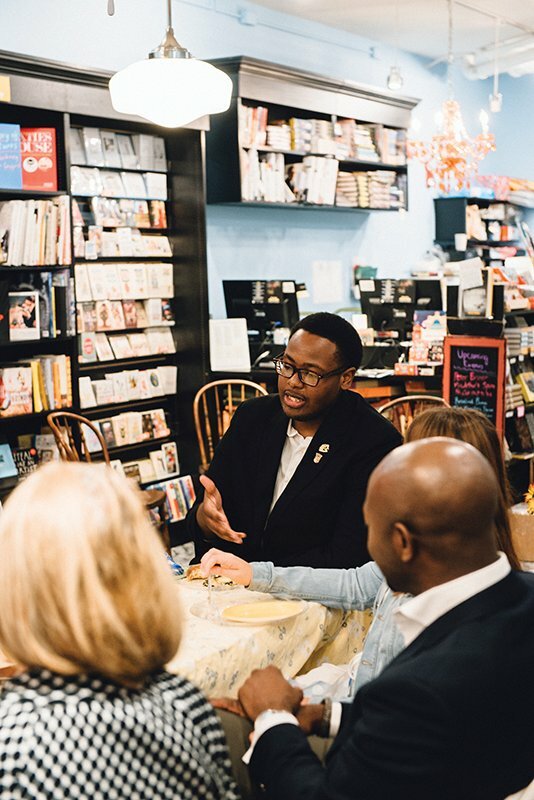 We can measure ‘growth’ with historical preservation, too,” Delaitre Hollinger said over the dinner at Midtown Reader. Taylor House in Frenchtown was placed on the National Register of Historic Places in 2015 in part because of this fifth-generation Tallahasseean, who serves as CEO of the National Association for the Preservation of African-American History & Culture. But the question behind Hollinger’s point was heard frequently over the course of the evening: How can Tallahassee grow — not just physically, but economically and culturally as well — while preserving what makes it great? How can Tallahassee grow for everyone? The group largely spoke in abstract terms, with some specific exceptions. As an example of a project that could draw together everyone in the community, Paul Bradshaw, founder of Southern Strategies lobbying firm, proposed creating canopy roads lined with live oaks on all major roads leading into the Capitol in conjunction with redesigning the city’s electrical grid so it is underground, hurricane-proof and powered by solar energy. 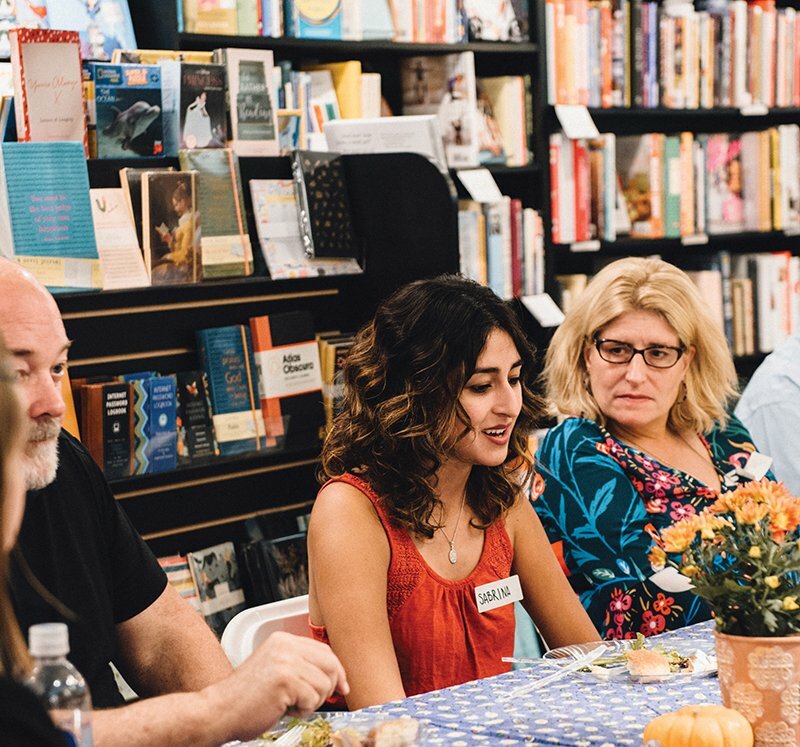 Sabrina Torres hoped to see more grassroots programs like TallySOUP, a communal meal in which community members pitch local projects for funding (Help Shelf free food pantries is an example of a recent winner). Skip Foster said he wants to see more of Tallahassee’s “unsung heroes” acknowledged for their work. Liz Joyner would like more Americans to host dinners in the style of Jefferson. “We’ve gotten out of the habit of intentionally seeking out our political foes, as Jefferson did around his table so long ago. One thing all who attended the Jefferson dinner in Tallahassee agreed on was the need for more face-to-face conversation, and they pledged to meet again.